DEATH WISH: Flashback 2009: Nobel-Winning Warmist Economist Thomas Schelling ‘Wished’ for ‘tornadoes’ and ‘a lot of horrid things’ to convince Americans of climate threat! 2010: DEATH WISH: Warmist Michael Tomasky admits he’s cheering for more natural disasters to convince people of man-made global warming! One could write this off as just another emotional rant from an uneducated Hollywood celebrity. But Ruffalo has quite a following, including 3.4 million Twitter followers and the media’s admiration. 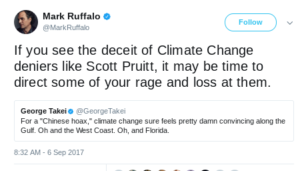 So it is not without consequence when the actor invites his minions to attack a Trump Administration cabinet official and anyone deemed a climate change denier. Considering one of Ruffalo’s fellow Bernie Bros tried to assassinate several Republican congressmen earlier this summer, nearly killing one of them, it’s outrageous for a top celebrity activist to fan the flames in this kind of political environment. It’s also a bit ironic, since he routinely tweets about love, compassion, and tolerance. “The victims of Hurricane Harvey have a murderer—and it’s not the storm.​..What makes this so infuriating is that it shouldn’t be happening. Experts have warned for decades that global warming would increase these sorts of weather extremes and that people would suffer and die if protective measures were not implemented,” Warmist Mark Hertsgaard wrote in The Nation for the September 25 issue. “When the president announced in June that he was withdrawing the United States from the Paris climate accord, I wrote in The Nation: ‘To refuse to act against global warming is to condemn thousands of people to death and suffering today and millions more tomorrow. This is murder, even if Trump’s willful ignorance of climate science prevents him from seeing it,” he added. 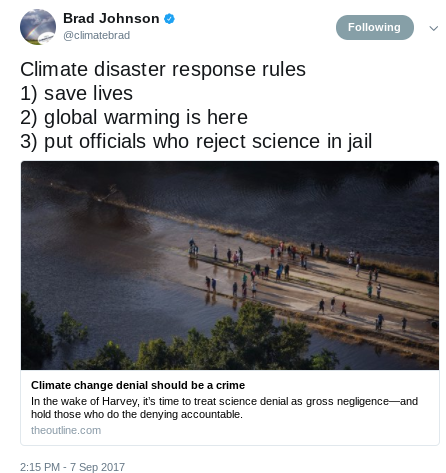 Climate activist Brad Johnson followed suit and demanded: “Put official who reject science in jail” as he blamed Irma on climate change. Meanwhile, other environmental activists prayed for Hurricane Harvey to hit Texas so that it could damage it’s oil pipelines. Climate Activists Peter C Frumhoff & Myles R Allen wrote in the UK Guardian that they blame industry for worsening storms. 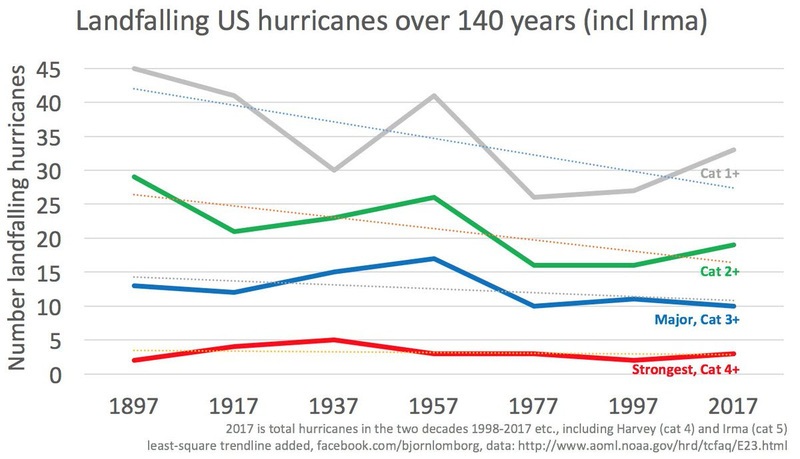 “We know that the costs of both hurricanes will be enormous and that climate change will have made them far larger than they would have been otherwise,” Frumhoff and Allen wrote. All extreme weather and other disasters “unfairly hit the poor” including war, famines, etc. The “poor” will always have it worse than the wealthier when it comes to resources to battle disruptions. Climate Depot Response: “Wow. Governments set the “pace of climate change.” About as likely as witches controlling the weather. 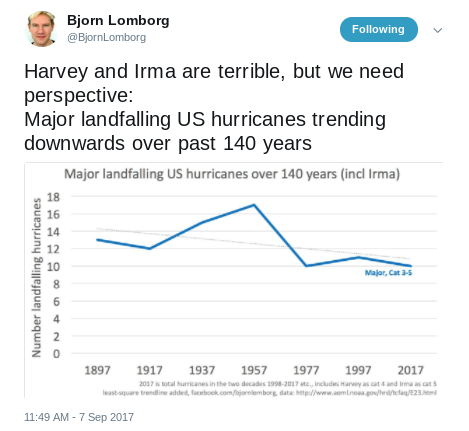 The so-called “consensus” is very unclear about hurricanes. 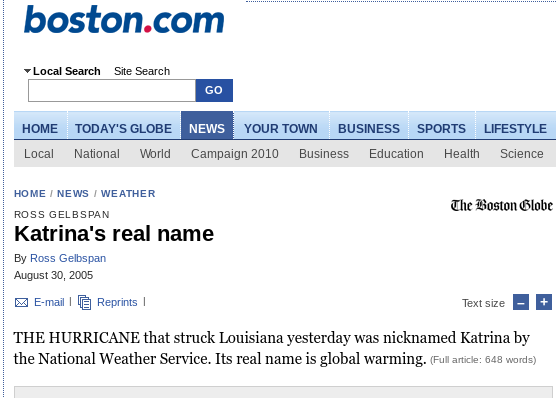 See:What Hurricane ‘consensus’?! 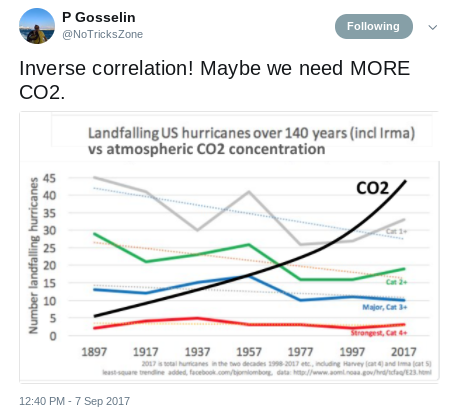 ‘Global warming’ causes MORE hurricanes — Except when it causes FEWER hurricanes – Stop the confusion! Global warming will cause less hurricanes or more hurricanes or more powerful but less frequent hurricanes or have no known impact on hurricanes and will cause less rain or more rain. In other words, predict every possible outcome and you too can claim you predicted it! No matter what happens with hurricanes, the climate establishment can confidently claim, they were right. Michael Mann joins a long list of doomsayers who have predicted similar end times predictions about “global warming.” In 2004, the UK’s Sir David King suggested Antarctica would be the only place left on Earth cool enough for humans to live. Flashback 2007:UK Green Guru James Lovelock Predicts Global Warming Doom: ‘Billions of us will die; few breeding pairs of people that survive will be in Arctic’ (But Lovelock would later recant and become more skeptical of climate change. See: Alert: ‘Gaia’ scientist James Lovelock reverses himself: I was ‘alarmist’ about climate change & so was Gore! Global warming campaigners have seized the opportunity to link Hurricane Harvey to their cause, just as they have done with previous hurricanes. 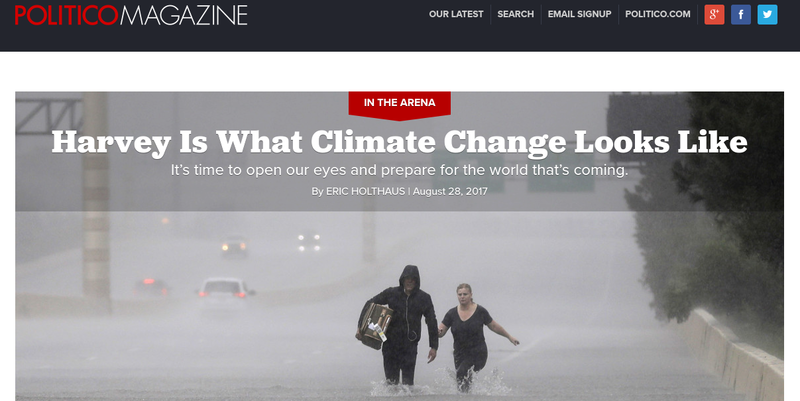 2017: “Harvey Is What Climate Change Looks Like” – Politico Magazine – By ERIC HOLTHAUS – August 28, 2017: Harvey is what climate change looks like. 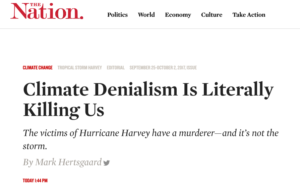 More specifically, Harvey is what climate change looks like in a world that has decided, over and over, that it doesn’t want to take climate change seriously. 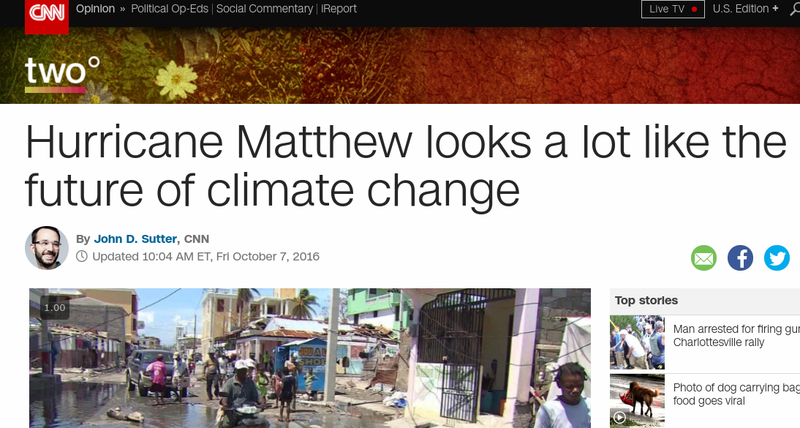 Flashback 2015: “Hurricane Matthew looks a lot like the future of climate change” – CNN – By John D. Sutter – October 7, 2016: But as the impact of the storm becomes clear, there’s an uncomfortable truth the rest of us should wrestle with: Hurricane Matthew looks a lot like future climate change. And if we want to stop storms like this from getting even more intense, we need to do everything we can to rid the economy of fossil fuels.